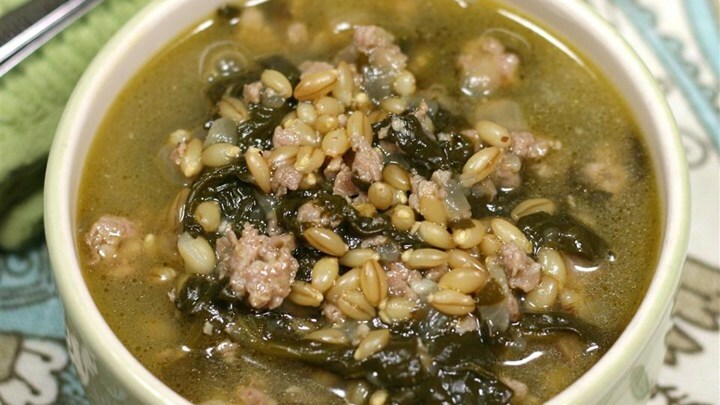 Turkey Sausage Barley Soup - Ed Hipp Foods, Inc.
Heat olive oil in a large pot over medium heat. Cook and stir onion in hot oil until soft, about 5 minutes. Add turkey sausage and garlic, breaking sausage into small pieces with a wooden spoon; cook and stir until sausage is browned, about 5 minutes. Pour chicken stock over the sausage mixture. Stir spinach into broth; bring to a simmer and season with kosher salt and black pepper. Bring the soup to a boil, reduce heat to medium-low, and cook at a simmer for 20 minutes. Stir barley into the soup and continue to cook until the barley is tender, about 1 hour. Source of recipe and photo: Allrecipes.com. Recipe by Juli Carvi.